You have many options when you want to share your map with others. All maps are private by default — only you as the creator of the map can view or edit it. 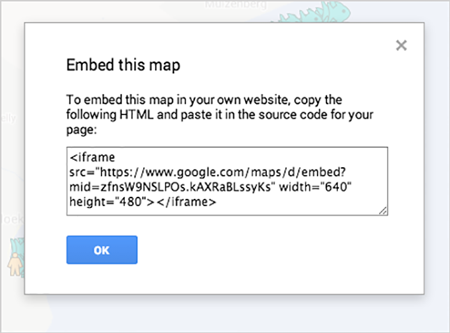 Below you’ll learn how to make the map public and embed it on your website, as well as how to collaborate on your map with colleagues. Click the Share button in the map menu. 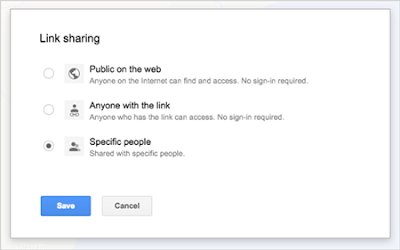 Under "Who has access", select Change and you’ll be given options to either leave the map "Specific people" (or private), "Anyone with the link" or "Public on the web". If you choose to make your map Public on the web, you’ll be able to further refine your share settings to make your map either just viewable or editable by the public. Tip: Sharing your map with a person who has a non-Google account? 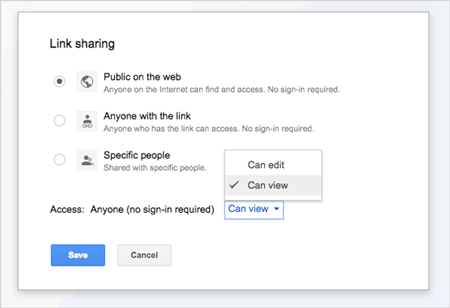 Copy the map URL and change the word “edit” in the URL to “view” before sending -- then no login will be required. Under “Add people” at the bottom of the menu, type in the e-mail addresses of the people you’d like to share your map with directly, or choose from your contacts. You can select whether the people you invite can edit the map or just view it. Tip: You can quickly add multiple collaborators to your map by sharing your map with a Google Group. Each member of group will have access to your map, and if you add new people to the group, they’ll have access too. Congratulations! You have learned how to import data, customize styles and share your map using Google My Maps.